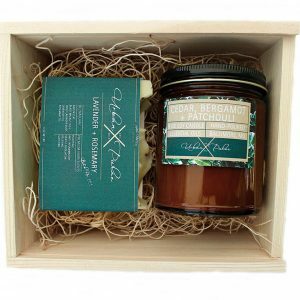 The most luxurious Valentine’s Day gift set sprinkled with Hibiscus petals and presented in this natural, wooden gift box. Whether you’re treating your spouse or telling a single friend that they’re loved on this holiday just like us relationship folk. Because gal pals matter too right?! This dreamy set includes our Rose Dust facial mist, Rose Quartz beauty roller, Frozen Ivy facial oil and Black Velvet face mask guaranteed to provide the most relaxing, calming beauty routine. Comes with an insert describing all of the uses, instructions and benefits of every product in this set. Enjoy! 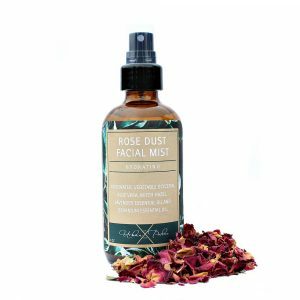 Gift Sets Includes: (1) 4 oz Rose Dust Facial Mist, (1) Rose Quartz Roller, (1) 1 oz Frozen Ivy Facial Oil and (1) 2 oz Black Velvet Face Mask in a wooden gift box with detailed product descriptions.